For families with three or more kids, taking a vacation can make you feel like misfits in a family-of-four world. It can be frustrating when standard rooms at a hotel or resort allow a maximum of two adults and two kids per room, and the property offers no other options other than to spring for a second room. These rules are especially irksome if the kids are little and would happily snuggle up on one bed with Mom and Dad. While most hotels and resorts offer adjoining rooms, this can be a pricey solution. Little kids can't stay in a hotel room alone, so sleeping arrangements can get complicated. There are a number of all-suite hotel chains (also known as extended-stay hotels) that offer accommodations that are noticeably larger than a typical standard room and blessed with a better floor plan. Typically, you can expect separate sleeping and living areas, sometimes separated by a partition or a door. In the living area, there will be a pull-out sofa and at minimum a small refrigerator, microwave, and sink. While specific amenities vary from brand to brand, they typically offer families spacious accommodations and a convenient layout that can sleep up to six in a standard suite, with larger suites available for bigger families. Many, but not all, all-suite chains offer free breakfast and Wi-Fi, too. When searching for accommodation for five (or more), the most economical options will be those places where five people are allowed in a single guestroom, which may be perfectly adequate when kids are small. All-suite hotels and extended-stay properties are a notch up in pricing, but you get more space and a more convenient floorplan compared to a standard room. It's almost always cheaper than opting for two adjoining standard rooms or a suite in a typical hotel. If you need to book two adjoining rooms at a hotel or resort, look for a discount for the second room. Many places offer a discount of 50 percent for families. Theme park resorts such as Disney World and Universal Orlando offer all-suite properties among their hotel options. Families of five or more may also want to consider a vacation home rental where you get even more space and home-like features such as kitchens and laundry facilities. A short-term rental is often comparable to a mid-priced hotel. The trade-off is that there will be no restaurants or other services. Each suite at the Hyatt House is designed to be a home away from home, including one or two bedrooms separated by a door from the living space and—joy!—a full kitchen. Most locations offer a grocery delivery service, too. All locations have a pool. You'll find a Hyatt House internationally, with more than 100 total locations, and in places in the United States where families like to vacation such as Boulder, Colorado; San Diego–Carlsbad, California; and Anaheim, California. Residence Inn studios have separate sleeping and living spaces. If you book a one- or two-bedroom suite, there will be a door that separates the living area with a sofa bed. Perks include a full kitchen, laundry room, and free breakfast buffet. Most locations have a pool and a fitness area. The Residence Inn has 700 locations around the world including some family vacation destinations such as Salt Lake City, Utah; Tucson, Arizona; and Virginia Beach, Virginia. Homewood Suites provides spacious suites (typically with a door separating the bedroom and living area) and have full kitchens. Guests can take advantage of the free breakfast and evening social with snacks and drinks. Free Wi-Fi is also available. Homewood Suites has more than 350 locations in the United States and Canada including Anaheim, California, and Charleston, South Carolina. Embassy Suites' accommodations are two-room suites with a door that separates the bedroom from the living area with a pull-out couch. A fridge, microwave, and two TVs are standard. A free breakfast and evening reception with snacks and drinks are available at all locations. Many locations have a pool. You'll find Embassy Suites in 245 locations in the United States, Canada, and Latin America including Orlando, Florida; Honolulu, Hawaii; and Las Vegas, Nevada. This Marriott brand offers suites with a partial wall separating the bedroom from a living area with a pull-out sofa, fridge, and microwave. All locations have a pool. SpringHill Suites offers free breakfast daily and free internet. For those snack cravings, you can enjoy a 24-hour pantry with beverages, nuts, cookies, and popcorn. SpringHill Suites has more than 400 locations including Myrtle Beach, South Carolina; Jacksonville, Florida; and Toronto, Canada. 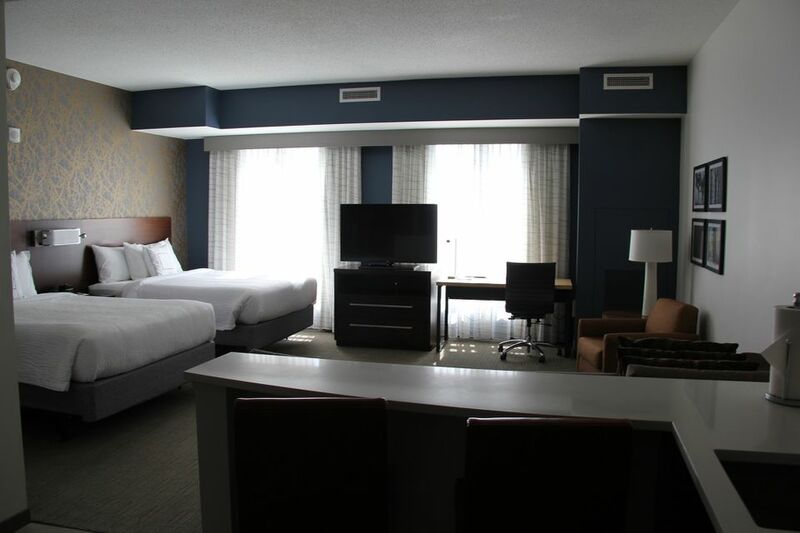 Hyatt Place suites are like oversized hotel rooms and include a sitting area with a sofa bed and a mini-fridge. Free Wi-Fi is standard. They are pet-friendly. Hyatt Place offers breakfast served fresh every day with hot breakfast items, fresh fruit, and local and regional specialties. Breakfast comes with coffee, milk, juice, or tea. Breakfast is free with a World of Hyatt membership, which you can join when you make a reservation. You can also dine anytime, 24 hours a day with their 24/7 gallery menu. The 24/7 Gallery Market has prepackaged salads, snacks, and desserts. Hyatt Place has more than 325 locations worldwide including Chicago, Illinois; Phoenix, Arizona; and Atlanta, Georgia. Comfort Suites is a budget-friendly choice offering suites that can accommodate up to six people (think an oversized room with pull-out couch). There are free breakfasts including the infamous waffles as well as Wi-Fi. The 100 percent smoke-free all-suite hotels have a refrigerator and microwave in each room and a fitness center and pool in just about every location. Comfort Suites lodging is available internationally and has many locations within the United States such as Miami, Florida; Newark, New Jersey; and Knoxville, Tennessee.